ABB’s Dodge® Passport is the easy-to-use selection program for Dodge mechanical power transmission products. With over 140 years of industry expertise, Passport ensures consistent, reliable selections and provides you with peace of mind when making your selections. Featuring an intuitive selection process, Passport guides both novice and expert users through quick and accurate selections, and it’s capable of designing both product and application-specific solutions. 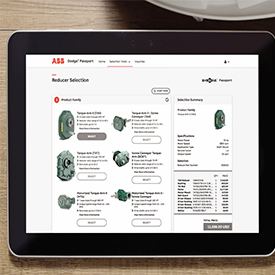 Passport seamlessly selects complete packages of Dodge products, Baldor-Reliance® motors, and ABB motors, and it’s fully connected to the PT Place E-commerce platform, allowing users to quickly convert selections into orders.